The current carbon stock change method requires that participants account for any carbon gains or losses (e.g. through harvesting or damage). Under the new averaging system, a forest will earn units up until a long-term average carbon value is reached. Participants will only claim credits once and face no unit liability in the event of harvest or natural disaster, so long as replanting occurs. It is hoped that the simplicity and reduced risk to forest owners will encourage planting and help to meet the government’s One Billion Trees objectives. Further announcements are expected soon, to provide more detail on how averaging will work, and whether forests already in the ETS can transition to averaging. A report released by the Parliamentary Commissioner for the Environment has recommended a major change to the ETS framework via the development of two separate targets for biological and fossil emissions. Carbon units can currently be used to offset all greenhouse gases, and the report questioned the difference in lifespan between gases such as carbon dioxide and methane. It recommends that forestry offsetting be allowed only for biological GHGs, with carbon emissions to be reduced by other means. However, Climate Change Minister James Shaw has disregarded the possibility of a two-system approach, citing regulatory predictability as a key factor. 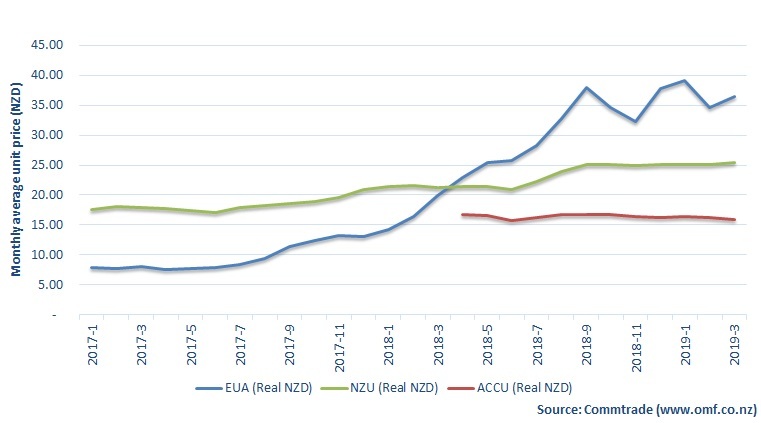 NZU prices firmed through the month of March and have remained in a range of $25.50 to $25.70 for the last two or three weeks. The gap between market pricing and the $25 FPO is significant enough now that some emitters with units in hand are looking to take the FPO and sell their units instead, pocketing $0.50 per unit in the process.